Filming took place from February to July 2017 in the United Kingdom and Hawaii. Produced and distributed by Universal Pictures, Fallen Kingdom premiered in Madrid on May 21, 2018, and was released internationally in early June 2018 and in the United States on June 22, 2018. The film grossed over $1.3 billion worldwide, making it the third Jurassic film to pass the billion dollar mark. It is the third highest-grossing film of 2018 and the 12th highest-grossing film of all time. 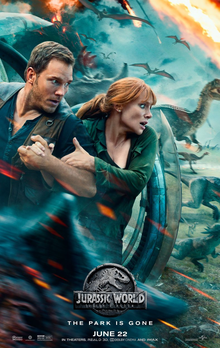 It received mixed reviews from critics, who praised Pratt’s performance, Bayona’s direction, the visuals, Michael Giacchino’s score and the “surprisingly dark moments”, while others suggested the series had run its course, criticizing the screenplay and lack of innovation. An untitled sequel is set to be released on June 11, 2021, with Trevorrow returning to direct.